Happy Saturday Stampers! Hope your weekend is off to a beautiful start. I spent last night creating my cards as part of the Design Team for Sunday Stamps and Nacho Average, which I'll show you later this week. I started watching The Hobbit: An Unexpected Journey, which I kept missing various parts of the movie. I love Gandalf's character. But then I never knew about the fifth wizard! WOW! Someday I'll read the books. Anyhow, on to my card. I'm participating in a new blog challenge, Tis' The Season, which was started by my friend and fellow designer and creator of Sunday Stamps blog challenge Holly. It's a fun blog challenge where it's Christmas all year long. They have a color challenge this week which inspired me to create a nontraditional Christmas card-using bright colors! Melon Mambo, Tempting Turquoise and Pear Pizzazz. I'm also participating once again in the blog Techno Stamper with Mary Jo's sketch. I love it when I can combine blog challenges, at least color ones and sketches. So much inspiration from both blogs. Thanks for stopping by today! Hope you have a great Saturday. 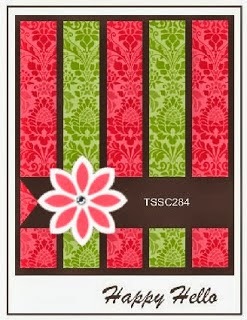 Come back tomorrow to see my new creation for Sunday Stamps. Beautiful card, you combined the colors and the sketch wonderfully! The touch of glitter behind your tree and the colored panels looks fabulous! Ohhh, love this. I love non-traditional colors for Christmas. Love the sparkle on here tool Thanks so much for playing along with my sketch challenge this week! Great job combing the two challenges! Such a great way to get the green on the card! That little tree is so cute, and I love the circle of glitter paper behind it! Great job! This is gorgeous Kathya.. I love that pop of glitter behind your tree. Thanks for playing along with us at 'Tis The Season!